Do you need additional R6 licenses? Effective July 9, 2018 Avaya will no longer have Communication Manager Release 6 licenses for sale. If you are not planning on upgrading your phone system this year you should make sure you have enough licenses. Waiting may mean you will not be able to add users to your current release 6 system when you need to. In order to find out what you are currently licensed for there are a couple of places to look. 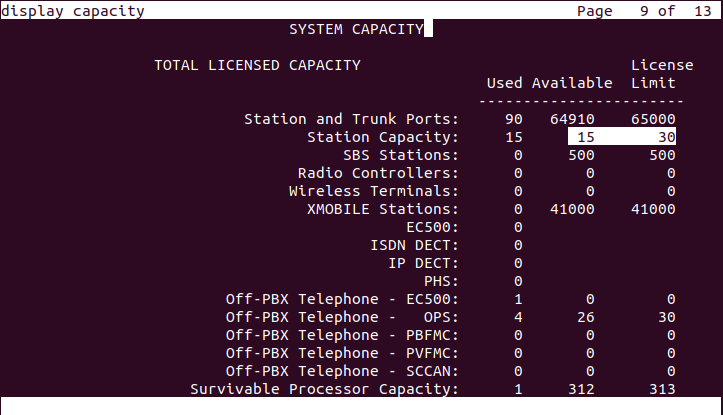 You can look in Communication Manager by running the command display capacity and look at page 9. This will give you a high level view of where you are but will not tell you exactly what types of licenses you have. For example in the screenshot below we have 30 licenses total and have 15 free licenses. It is recommend you have at least 15-20% capacity above your license limit.